As the daughter of highly respected Turkish classical musician Ihsan Özgen, Neva Özgen was born in Ankara in 1977 and grew up in Istanbul surrounded by Turkish classical music and jazz. Perhaps as a means to carve her own path, Neva's first expressed interest was in Western classical music and the flute. She learned to play both soprano and alto flutes but soon after entering the Istanbul Technical University Conservatory she switched to clarinet. It wasn't long before her interest in Turkish Classical music overtook her interest in Western classical traditions and she decided to study the kemençe, an instrument integral to Turkish classical music. Ironically, it was during this period that her father began to experiment and pursue his interest in jazz and other forms of music. While her father, and main influence, Ihsan Özgen focused on playing experimental, cross-cultural, jazz pieces and taksims (improvisations). Neva has deeply immersed herself in the works and taksims of Tanburi Cemil Bey.Like many kemençe players in Turkey today, she aims to continue the tradition established by Tanburi Cemil Bey which was passed on to her father. Ihsan Özgen's influence on his daughter cannot be underestimated and Neva Özgen can be considered a student of what is recognized as the 'Ihsan Özgen school' of Turkish classical music. She has accompanied him in performances of Turkish classical music in Europe, in the United States and Turkey and as Ihsan Özgen moves on to explore more experimental forms of music. She has already played on two recordings, Aegean and Balkan Dances and Masterworks of Itri and Meragi, by the Turkish classical Anatolia Ensemble which her father led for many years. Neva Özgen is also featured on a recording titled Women Composers and Performers of Turkish Classical Music. Though Neva's primary passion is Turkish classical music, she has inherited her father's adventurous spirit as well as his talent. 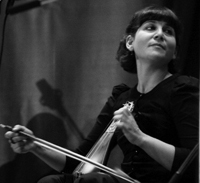 Neva has performed with Orbestra in England and with American jazz musician Butch Morris' group in New York alongside Turkish ney player Suleyman Erguner. Recently she performed with Canadian violinist Hugh Marsh, percussionist Ben Grossman and vocalist Brenna MacCrimmon in the Mercan Dede Ensemble which blends Eastern and Western musical traditions. She has also performed with Anatolia Ensemble, Montreal Tribal Trio, Atlas Ensemble, Nederlands Blazers Ensemble, Nv/Elect.Voices, Istanbul Authentic Turkish Music Ensemble, Shujaat Hussain Khan, Deepak Ram,Peter Murphy, Mich Geber, Kudsi Erguner, Frangiz Ali-Zade, Javanshir Guliev, Theo Loevendi, and Kamran Ince among others. She gives lectures about Turkish Maqam Music in Conservatory of Amsterdam in the week of Atlas Academy and introduced and performed kemençe to the foreign composers for helping them to write new music for the instrument since 2009. She attended as a tutor in More Project in England 2010. Özgen believes that a musician must be well versed in the classical works of master composers but she also believes that classical forms of music can be expanded and built upon through improvisation. Truly her father's daughter, she believes in searching for new idioms through playing with the classics and that all new musical languages are built upon the foundations of the past. Legacy, which is released in September 2001 by Golden Horn Records, is Neva Özgen's debut album. She is an assistant of professor in Istanbul Technical University Conservatory.